On this particular spot of our world springtime is nowhere near. We haven't any illusions that we can smell it, or taste it - nor are we seduced or flattered by tiny but bright flashes of sunshine. Well, some of us aren't. I know that we have months to go, yet. Today the babes and Eric played long and hard outside. I worked inside, and smiled to hear their shouts of jubilation as they played tag, and chased eachother, and played hide-and-seek, and baseball. At some point I went outside... just because their glee tempted me to join in their fun. And I rejoiced in seeing my husband sitting in a camping chair (his favorite - which he had dug out from the garage) with a glass of beer in his hand, sun glinting off the metal legs of the chair. And I smiled at my children swinging on the tree swing that hangs from our huge pine. 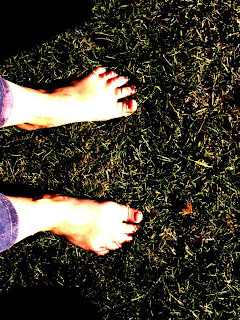 And I noticed the warmth of the ground... under my very bare feet. But a lovely reminder that there is A Time For Everything, and the best this Mama can do is to appreciate what this day and (more importantly) these loves of mine offer. And to say that it is enough. i love what you've done with the place. you amaze me with your crazy computer skills.